Located in Shoghi, this cottage is ideal for a couple looking to spend a lavish holiday in the tranquil environment of the Himalayas. 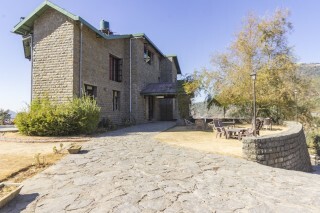 The property is surrounded by a dense cover of pinewood and deodar trees and the room on offer can accommodate up to three people. Breakfast is provided on request. Your Space This stone-walled cottage is fronted by a well-manicured garden. 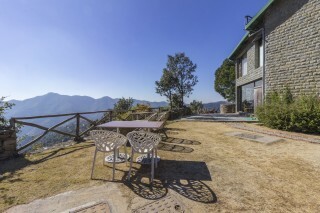 There is ample seating here for you to enjoy your morning beverage and soak in the overwhelming view of the mountains. 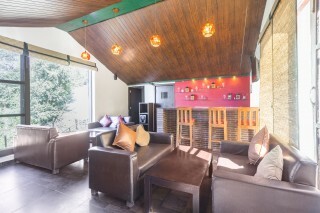 Inside, the living room is furnished with leatherette sofa sets and coffee tables. There is a well-stocked bar at one end of the room so you can enjoy your favourite drink at the end of a long day! The dining room is furnished with comfortable seating to ensure you enjoy all your meals. There is a spa in this stay, so relax and spend the day getting that much deserved massage. The recreational room has a pool table and a TT table to keep you entertained while you’re indoors. A Jacuzzi is also present here that adds an extra touch of luxury. The room on offer is designed with a wood-panelled ceiling and wooden flooring. It is furnished with a plush double bed, two bedside tables, a two-seat sofa, a coffee table, and a writing desk. 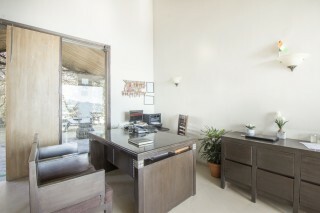 There is a flat-screen television for you to watch your favourite shows even while on holiday. There is a spacious storage unit and a mini-refrigerator for your convenience. The en suite washroom is tiled and appointed with western sanitary ware and modern fixtures. 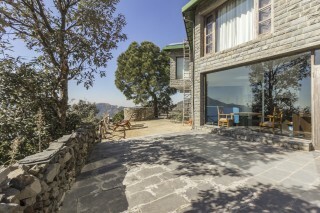 The attached balcony has ample seating for you enjoy the panoramic landscapes with a hot cuppa in hand! Guests are requested to provide valid identification at the time of check-in. Travel assistance is available. Car/bike rental is available. Pick up and drop off on request. Places to visit: Christ Church - 23.3 km approx. The Mall - 16.7 km. approx. Jakhu Temple - 21.9 km. approx. The Ridge - 16.5 km. approx. Shimla State Museum - 15.1 km. approx. Tara Devi Temple - 2.1 km. approx. Kali Bari Temple - 16.4 km approx. 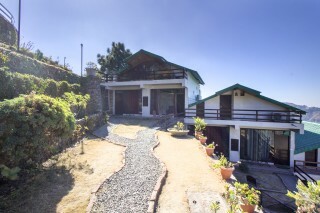 Shoghi Railway Station - 3.5 km. Shimla Airport - 23 km. 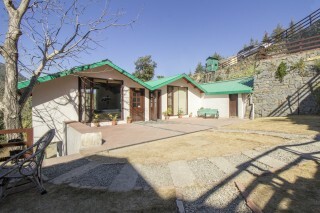 Shoghi Bus Station - 3.3 km.